CHARLOTTESVILLE, Virginia (WTVD) -- Kyle Guy scored 17 points, London Perrantes had 13 and No. 23 Virginia used a small lineup to neutralize No. 5 North Carolina's size in a 53-43 victory Monday night. Guy connected on five 3-pointers for Virginia (20-9, 10-7 Atlantic Coast Conference) and Perrantes hit three, continuing to emerge from a shooting slump that contributed greatly to a four-game skid for the Cavaliers. Joel Berry II scored 12 points to lead the Tar Heels (25-6, 13-4), who snapped a four-game winning streak. ACC player of the year contender Justin Jackson, who arrived averaging 19.9 points in league play, was guarded most of the night by Perrantes and scored just seven points and missed seven of his 10 shots. Tony Bradley was one of the few Tar Heels to have any offensive success, hitting 4-6 shots for 8 points. The Cavaliers opened a 33-23 lead early in the second half, then saw North Carolina scored the next six points to pull to 33-29. But Devon Hall hit a pair of free throws and Guy followed two Tar Heels misses with a 3-pointer. 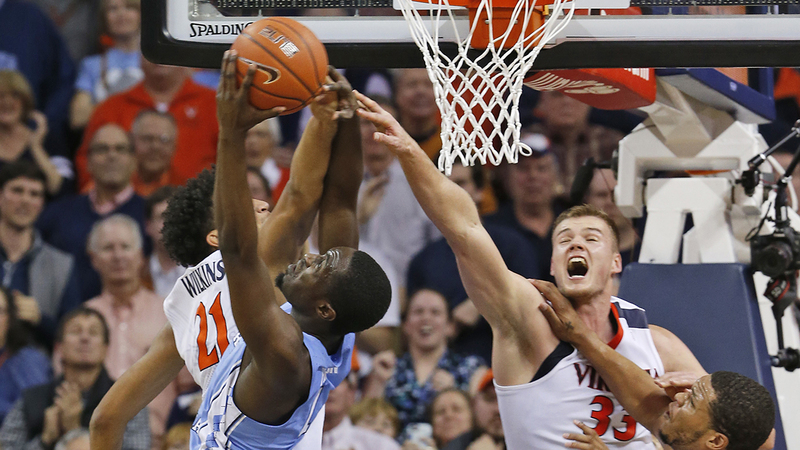 After the Tar Heels trailed 40-39 with 9:26 left, Perrantes made back-to-back 3s for Virginia, rousing the crowd at John Paul Jones Arena to deafening levels. When Jack Salt added a putback that lingered on the rim, then dropped, the outcome seemed certain. North Carolina, averaging 86.2 points, scored just four points in the game's last 9:26. The Tar Heels might not have been as sharp as they would have been had they not already clinched at least a share of the ACC regular season title, but Monday night's game marked the fourth time this season they have scored 23 or fewer points in the first half. They also had 12 turnovers by halftime after averaging just 9.7 in their previous seven games. The Tar Heels close the regular season at home against Duke on Saturday night. Virginia wraps up the regular season looking to avenge an earlier loss to Pittsburgh on Saturday afternoon.